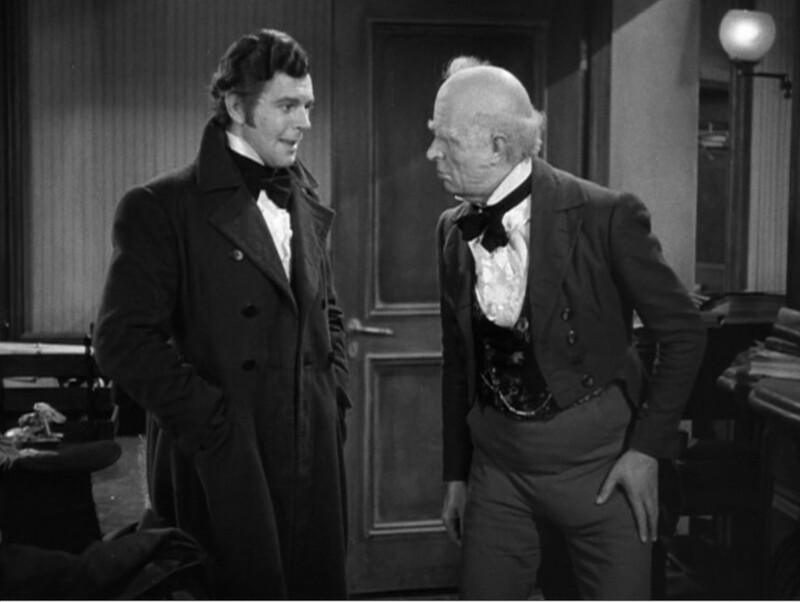 In Stave I of Charles Dickens’ “A Christmas Carol,” Fred debates the value of the spirit of Christmas with his uncle Ebenezer Scrooge. The debate takes place in the evening on a dark, cold Christmas Eve in his uncle’s office. Fred invites his uncle to dine with him on Christmas Day and his uncle declines calling Christmas a “humbug.” I have always thought the term “humbug” meant something frivolous or devoid of meaning. It turns out the definition is a little more specific than this. According to the Merriam-Webster dictionary “humbug” is defined as “language or behavior that is false or meant to deceive people.” If this is the definition of humbug Charles Dickens intended it casts a slightly different shade on why Ebenezer Scrooge chose this word to describe Christmas. Throughout the novella Scrooge retorts “humbug” to various things he encounters. For example, when Marley’s ghost appears in his room he utters “humbug.” It seems clear that by “humbug” he means that he does not believe what he sees to be actually real. But according to the definition of the word it would seem that he does not believe what he sees because he feels that someone or something is trying to deceive him. In the same respect he tells his nephew that “Christmas is a humbug” which I therefore take to mean that he does not believe in Christmas because he sees it as some sort of grand deception. Given his material preoccupation I assume he sees Christmas as a deception by the people who profit from the economic activity associated with the holiday. But perhaps he also senses a more spiritual deception going on. This would explain all the ghostly activity to come later that night. Here he pays a winking acknowledgement to the reason for Christmas (i.e., Christ’s incarnation) but does so in a way to suggest that this is not the thrust behind this story (i.e., A Christmas Carol). I do not believe this is a Fox News “War on Christmas” type of thing. It is merely to say that the story Dickens is telling, although set within a Christian context is not about Christianity per se. Rather, it is the story of one man’s spiritual redemption from himself. In a sense Scrooge in this story has pulled the wool over his own eyes. He is perpetrating a humbug on himself, so to speak. … as a good time: a kind, forgiving, charitable, pleasant time: the only time I know of, in the long calendar of the year, when men and women seem by one consent to open their shut-up hearts freely, and to think of people below them as if they really were fellow-passengers to the grave, and not another race of creatures bound on other journeys. I assume most people recognize the childlike spirit of the season he describes. I remember feeling this more intensely when I was younger. Essentially, there is something about the Christmas season that makes people want to be nicer to each other, to relax their egocentric judgment and to pay less attention to false excuses for division such as politics, race and indeed religion. Children are not as fixated on these things. They only come to value them when they are taught to value them by adults. Jesus himself said, “… Verily I say unto you, Except ye be converted, and become as little children, ye shall not enter into the kingdom of heaven.” (MT 18:3). Perhaps this childlike spirit of Christmas is a glimpse of the kingdom of heaven. Perhaps this childlike spirit is revealed when one pulls back the various humbugs of adulthood. Clearly Scrooge is the antithesis of the childlike spirit Fred describes. For one thing, he is old. I have often heard people react to “A Christmas Carol” by saying that even though Scrooge redeemed himself he must have been disappointed or regretful that his redemption did not happen earlier in life. But this observation misses the point, I think. 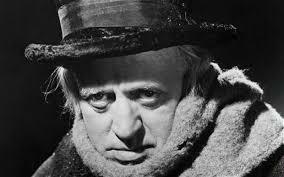 It is precisely Scrooge’s age in spirit that required redeeming. He had to become more childlike to enter the kingdom of heaven. As such, his physical age is symbolic of his spiritual age which exudes all the traits of ego dominated adulthood. And therefore, uncle, though it has never put a scrap of gold or silver in my pocket, I believe that it has done me good, and will do me good; and I say, God bless it! Here he contrasts this childlike spirit of Christmas with the materialism with which it stands in opposition to. A childlike spirit is not cynical. It does not suspect a humbug around every corner. It is not greedy, grasping or full of ego. It is not mean spirited, judgmental or racist. Rather, the childlike spirit of Christmas is open hearted, compassionate, full of life, anticipation and excitement. It exposes the humbug of division and reveals the true fact that we are all “fellow passengers to the grave” and this earthly existence and our physical, skin deep appearances are not what is ultimately important. When the Ghost of Christmas Present disappears the Ghost of Christmas Future approaches. This final ghost wears a black robe and does not speak. Scrooge is afraid but states he desires to be a different person and believes that by adhering to the ghosts’ program he will, in fact, transform. The ghost leads Scrooge into the city among the merchants. A small group of businessmen talk about a dead man. They do not seem to care about him except they are interested in who will inherit his money. One man expects no one will go to the funeral. Another man says he will attend the funeral if there is a lunch. The ghost then leads Scrooge to two other businessmen whom Scrooge recognizes and admires. They have a very short interchange where one of them mentions a certain “Old Scratch” had died. Scrooge assumes these two conversations are about the same man but at this point seems to be in denial about the dead man’s identity. The scene changes to a bedroom. The ghost points to a body lying under a sheet. Scrooge cannot take the sheet off of the body. On some level he knows the body is his own but he persists in his denial. He hears a cat behind a door and rats scurrying beneath the floor and knows what they will do to the body if given the chance. Again, the ghost points to the sheet covering the body but Scrooge cannot remove it. 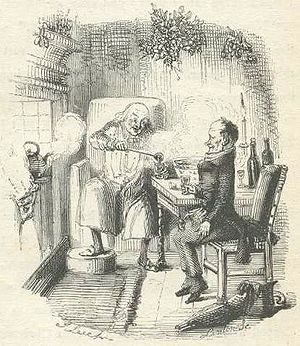 Scrooge pleads with the ghost to show him emotion connected with the dead man. The ghost shows him an anxious woman. Her careworn husband arrives home and she asks him what news he has for her. The man replies that the news is bad, that the man to whom they own money has died. She is visibly relieved upon hearing this news. She feels guilty about feeling happy in relation to a death but happy nonetheless. 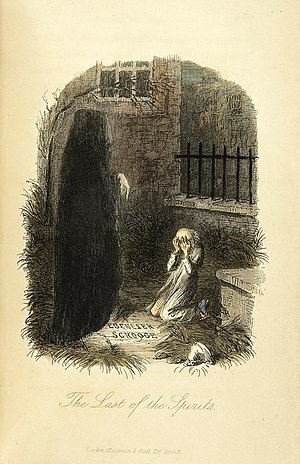 Scrooge is not satisfied with this scene and asks the ghost to show him “tenderness” connected with the man’s death. 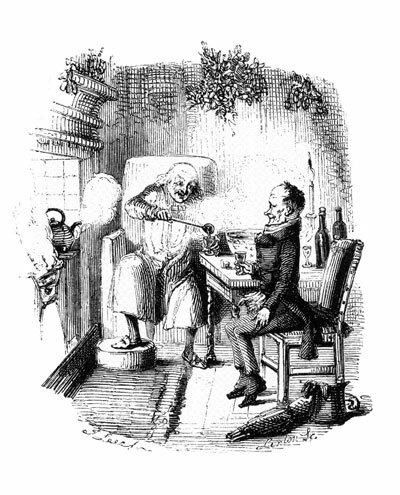 The ghost shows Scrooge the house of Bob Cratchit. The family is sad and quiet. Bob arrives home and they try to comfort him. He pretends to be cheerful but breaks down crying. Tiny Tim has died. Before I draw nearer to that stone to which you point … answer me one question. Are these the shadows of the things that Will be, or are they shadows of things that May be, only? … Men’s courses will foreshadow certain ends, to which, if persevered in, they must lead… But if the courses be departed from, the ends will change. Say it is thus with what you show me. The ghost does not answer and continues to point to the tombstone. It is obvious that Scrooge does not want to die alone and unloved. This is interesting because before this evening he did not seem to care for the company of people at all. It seems strange that such a person would be motivated by the fear of being unloved. Perhaps Scrooge had buried this aspect of his personality under the psychological defense mechanisms he had constructed to protect himself from the abandonment he suffered during childhood. Scrooge panics and drops these defenses. He states that he will keep Christmas in his heart. The transformation is complete. The ghosts’ program was a success. Suddenly the Ghost of Christmas Future transforms into a bedpost and Scrooge finds himself back in his bedroom. Scrooge wakes again at 1:00 am and pulls back all the bed curtains to avoid being surprised as he was with the Ghost of Christmas Past. He lies in bed for fifteen minutes waiting and feeling anxious. At this point he becomes aware of light shining from under the door to an adjacent room. He gets up to investigate and as he approaches the door a booming voice bids him enter. The voice belongs to the Ghost of Christmas Present. When Scrooge enters the room he is surprised to see it brightly lit, richly decorated and full of food. The ghost is clothed in a robe with a crown of holly atop his head and sits on a throne made of various meat products. “You have never seen the like of me before,” says the ghost. Scrooge has not. The ghost tells Scrooge that he has more than 1800 brothers who have walked the earth before him. This story, of course, takes place in the 1800’s. It is a fairly obvious assumption that the ghost has had one brother a year walk the earth since the birth of Christ. This is yet another indirect reference to Christianity. Scrooge admits that he has changed since the Ghost of Christmas Past’s visit and has a certain level of faith in this transformational program the ghosts have set up for him. He tells the Ghost of Christmas Present that he is in his hands essentially and goes forth with him. Suddenly they are walking forth in the busy city streets of London. It is a bright Christmas Morning. There is an air of cheerfulness among the people. Dickens goes at great length to describe an abundance of food. People are carrying their dinners to the bakers and going to church. As they mingle the Ghost sprinkles water on people making their mood alter for the better because different rules of civility apply on Christmas Day. There are some upon this earth of yours … who lay claim to know us, and who do their deeds of passion, pride, ill-will, hatred, envy, bigotry, and selfishness in our name, who are as strange to us and all our kith and kin, as if they had never lived. Remember that, and charge their doings on themselves, not us. This statement (one of a few lectures to Scrooge made by this ghost) may solve the riddle as to why Dickens only indirectly references Christianity within the spiritual universe existing in this story. I would guess he sees Christianity as good and true in its essence but perhaps corrupted in its practice for the most part. … if man you be in heart, not adamant, forbear that wicked cant until you have discovered What the surplus is, and Where it is. Will you decide what men shall live, what men shall die? It may be, that in the sight of Heaven, you are more worthless and less fit to live than millions like this poor man’s child. Oh God! To hear the Insect on the leaf pronouncing on the too much life among his hungry brothers in the dust. The scene shifts from the ghost to Bob Cratchit toasting Scrooge as “the founder of the feast.” His family does not agree and lets him know it, but Bob persists remarking that it is Christmas Day and different rules of civility apply. The family reluctantly toasts Scrooge and in a few minutes the good mood returns to this poor but happy family. And then they were in Fred’s house at the dinner party Scrooge was invited to. They laugh at Scrooge and how he disdains Christmas. Fred mocks him too but then reveals that he pities his uncle and intends to keep inviting him to dinner. Later they play games and Scrooge becomes involved and does not want to leave. Eventually, the ghost removes Scrooge and they continue their travels. At some point Scrooge notices that the ghost has grown old. He tells Scrooge that his life on the earth will end at midnight. 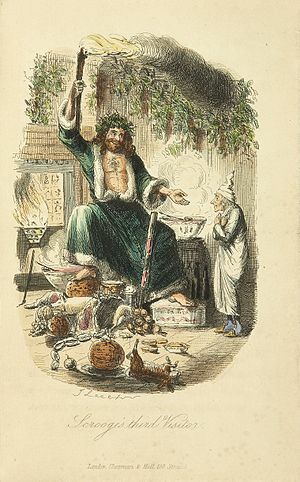 Scrooge sees a hand protruding from the ghost’s robe. Upon Scrooge’s inquiry the ghost reveals two retched children hiding under his robe. The boy is “Ignorance” and the girl is “Want,” the ghost tells him. They are the result of greedy men designing social structures that leave people behind. If ignored, these children will eventually bring about the doom of mankind. “Have they no refuge or resource?” asks Scrooge. The Ghost of Christmas Present then disappears as the clock strikes midnight.